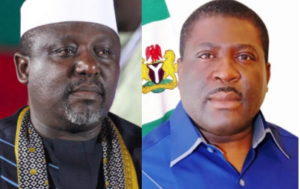 The rift between Imo State Governor, Rochas Okorocha and his deputy, Prince Eze Madumere has grown following an allegation making the rounds within the state that Madumere has abandoned his office for 90 days. In reaction to the rumor, the Special Assistant to the deputy Governor, Uche Onwuchekwa stated that the allegation emanated from mischievous elements. According to some members of the All Progressives Congress, APC, Allied Forces, the truth will always triumph over falsehood especially now that we are collectively fighting against tyranny, injustice, and fraud. Onwuchekwa emphasized on how responsible his boss is and that the insinuation that the Deputy Governor abandoned his office is untrue. He said that his principal has proved beyond doubt that he is a result-oriented public officer who has never abdicated his official responsibilities. One of the Civil servants in the Deputy Governor’s office who spoke on the conditions of anonymity also denied that Uche Madumere has been staying away from the office for a long time. According to the civil servant, despite the fact that the office leaks each time it rains, the Deputy Governor has been putting up with this ugly situation patiently. I really don't know what's up with Imo state. Rochas needs to concentrate on governing and stop witchhunting. they would be alright. Atleast they are working, APC governors are working.